When we lived in the Caribbean we saw some incredibly dumb things done by tourists and cruise ship visitors in the islands that we visited. Perhaps it's time to review a few of the common sense tips that you can use to make sure that your vacation is not ruined by petty or more serious crime. Everyone gets excited when you're traveling in new surroundings. Do not let that excitement make you a target for local criminals... it can completely ruin your travel experience. When you look like a tourist, you make yourself a target. Do not wear openly anything that makes you look like a visitor... such as wearing your cruise card around your neck, carrying a shopping bag that says Jim's tours, you can have a great time but don't necessarily remove all doubt about you being a visitor... there will be enough dummies for the local crooks to feast on... just make sure it's not you. Do not wear flashy jewelry or expensive clothing that makes you stand out... for instance, we saw several tourist from local resorts shopping in small Caribbean islands wearing Rolex watches, diamond bracelets, and Gucci loafers. Folks do you realize that if someone stole and fenced a Rolex watch that would represent several years worth of wages in many places. Be smart, leave your pretty stuff in the safe in your cabin or in your hotel room, you can impress your fellow passengers on the ship or fellow resort guests at the resort... not when you're out among the locals. A pleasant smile can go a long way, in a country where you don't know the language or are unfamiliar with your surroundings. We found that at least in the Caribbean, the locals were very shy, unfailingly polite to one another, and would bend over backwards to help you as long as you were pleasant. No, it doesn't do any good, in a local store, to say in a loud voice, "what a dump, I can't wait to get home"... do everyone a favor, stay home. 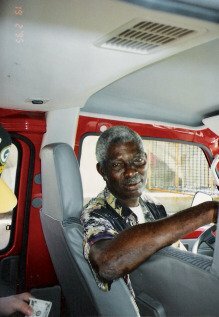 This is a picture of one of the local maxi taxi drivers in St. Croix... 14 passenger vans that would take you from one end of the island to the other for one dollar. Everyone entering the van without exception said good morning or good afternoon... you do the same, and they will tell you whatever you want to know about the place that you are visiting. You know that golden rule deal... it really does work, treat people like you want to be treated and you will have wonderful travel experiences. Carry your valuables in your front pocket, or in a fanny pack worn in front... and when you do open your fanny pack don't/a lot of cash... carry a change in singles, or small amounts of the local currency, in your front pocket. Don't do something stupid like try to buy something from a street vendor with a $100 bill... you might as well draw a target on your back. Hauling out a tourist map in a crowd will again draw attention to the fact that you are a visitor... if you have to consult the map, drop into a store and pull it out where not too many people can see you using the map. big break If you are lost, and can't speak the language, ask a storekeeperiif he or she can show you where to go. We were recently in Rome, and it is easy to get lost, seek out police persons or well-dressed office workers out for a break and ask where the Metro is...they will be more than glad to help you and not take advantage of you. If possible, travel in pairs or small groups... that's always safer than traveling alone... you can also save a lot of money to get together with some friends and split a cab or a small tour bus. Do your partying and drinking back on the ship or at the resort... a 10-year-old kid could have probably robbed some of the drunks I saw weaving down the boardwalk in Christianstead, St. Croix. We never went out at night by ourselves... we rarely went out at night even with others... it is just common sense. Some people are so afraid of being crime victims that they do not do traveling at all... that is a shame... if you use the common sense tips listed above you can visit anyplace in the world and be perfectly safe... so if personal safety is holding you back from taking that trip... just use your common sense, pack your bags and go. Thanks for reading travel safety tips.